Home > Ask Our Experts > My Blue Shark Seems to Panic: What Can I Do? Why does my blue shark (in a 60 gallon tropical fish aquarium) freak-out, panic and play dead? Is this normal? The fish is speeding through the tank, swimming upside down in circles and slamming itself against the tank's glass. I worry because it seems like it is desperately trying to get out of the tank. Please could you advise me as to the best course of action? There are several reasons why your shark could be behaving like this. The first thing to do is to check for disease. Often fish bash themselves off the sides and bottom of a tank in an attempt to get rid of parasites. However, if you do suspect infestation, be careful how you treat it. Bear in mind that sharks can be very sensitive to copper-based medication and check that any medicine you use is shark-safe. When does your shark behave like this? Does it seem to be doing the same thing even when it doesn't know you're in the room, or does your approach trigger it? Are other fish distressing it? Sharks may have a reputation as fearsome predators, but they can still suffer from bullying. Could other environmental factors be involved, like the amount of light or noise in the room? If you suspect this sort of thing, try to cut out possible factors one by one to work out the trigger. It's also possible that there's a trigger that is invisible to you - a magnetic field. Sharks can be very sensitive to these. Sometimes they're caused by electrical equipment near the aquarium, or even by the cables associated with your tank being coiled round in a series of loops (if you must coil them, twist them as you do so, but it's better to leave them loose). Depending on how long you have had the shark and where it came from, it's possible that it's simply unhappy in the aquarium environment. You could try covering one side of the tank with black paper so that it has a dark surface it can rest beside, helping it to feel more secure. Avoid approaching the tank quickly and make sure that, if the top of the tank is open whilst the fish are being fed, you stick to a routine it can become familiar with. Spending time with your shark will help it get used to the idea that you're not a threat, and will also give you the chance to spot any other problems (like bullying or parasites). You might also want to try playing music to it. Music with a predictable rhythm can be reassuring to fish because it gives them a sense of knowing what will happen next. Try something simple and see how it responds. Finally, if your shark doesn't calm down and if the upside-down swimming persists, you should consider the possibility that it has an infected swim bladder. Your local fish shop should be able to give you medicine to treat this, but it will be important for you to pay close attention to the shark afterwards and make sure, in particular, that it has a healthy diet. Sometimes too much rich food can lead to persistent infections. Good luck! Sharks are great fish, and well worth making an effort for. I have a 60l tank and 4/5 platies 1 siameese fighter 2 pencilfish 2 embers tetras 1 threadfin rainbow 1 hillstream loach and 5 rummy nosed tetras butone platie have his face torn and ripped and looks like a murder man the main problem is that we started with much more fish are siameese has started to come out more since are fish died hes more active is he the culprit. It just does not belong in a fish tank!!! 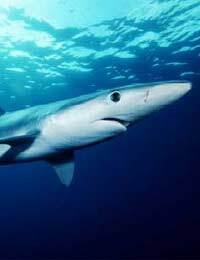 i know why your blue shark slamming itself against the tank's glass, because 60g is too small for them. smaller aquarium for blue shark is 180g.